Behind the arched iron gate, just across the street from the Montevarchi train station, in a quiet courtyard, nestled below tall pines, is one of the trendiest restaurants in Tuscany. With an updated take on Tuscan cuisine, the kitchen at Ristorante Galeffi never fails to please. 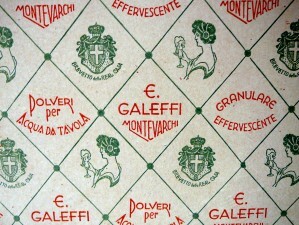 Ristorante Galeffi is built on the site of the late 19th century chemical pharmaceutical factory of Ernesto Galeffi. The family palazzo is to the left off the courtyard. All references to the past end with these artifacts. 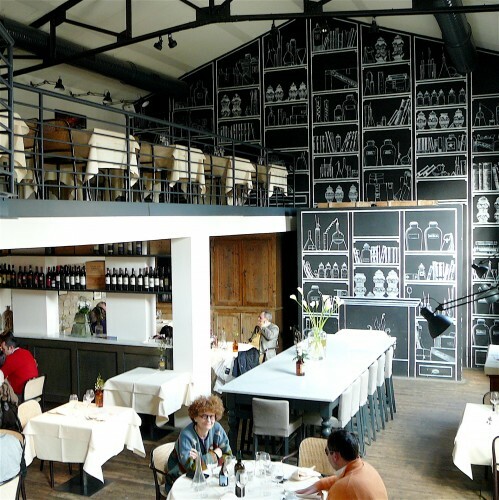 The decor is spacious and modern with two dining levels pulled together by a massive black and white graphic wall. Simple floral accents and the original wood floor soften the iron and glass architecture. Tall windows bring in sunlight and allow views of the trees. In the summer there is seating outside. The sophisticated menu is ever-changing, depending on the season and what is fresh at the market. One day the appetizers might include whipped salt cod on toasts with truffles or saffron creamed rice surrounding a tiny savory cake garlicky tomato-infused bread. 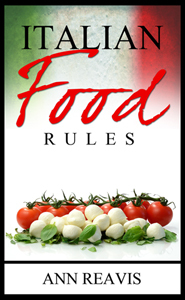 The second course could be risotto with creamy taleggio cheese and truffles or a fettuccine with a sauce of tiny fish and cherry tomatoes. A favorite main dish is rabbit with artichokes and a side of crispy fried vegetables. 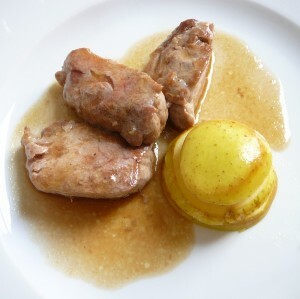 This vies with the filet of pork with a confection of layered apples and foie gras. 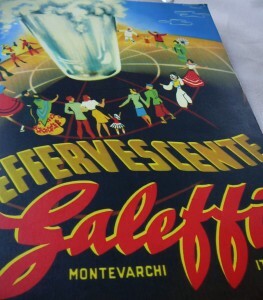 Dessert is a specialty of Galeffi. Warm chocolate torte is in competition with lemony cheesecake and a moist apple cake. The wine list is a joy to read, but it’s an even greater pleasure to try a bottle or two from the small exclusive wineries from the nearby Chianti Classico and Brunello regions. The somelier is knowledgeable and extremely good at food/wine paring. 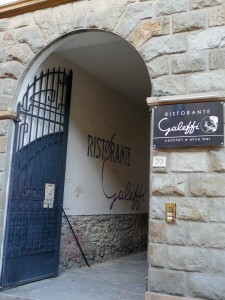 Ristorante Galeffi is a short train ride from Florence (it’s less than a block from the Montevachi station). It’s proximity to the luxury fashion outlet malls in Incisa and Montevarchi, make it the perfect place for lunch when driving from Gucci and Ferragamo at The Mall to the Prada outlet (SPACE). Ask if the Antica Farmacia Galeffi, the pharmacy museum, at Via Roma 95, is open. Its free. Ristorante Galeffi, Via Amm. Burzagli, 39 – Montevarchi. Open for lunch and dinner. loved it and will go back!!!! Looks nice. Did you know that Montevarchi also has an organic market with local produce, wine, unpasturized milk and jams and preserves. Probably not much at this time of year but as the growing season progresses it will fill up. We are not far from Montevarchi and would meet you there sometime if you want. You took me on a Florence tour that I won from Slow Travel several years ago.